On July 21, Paul Moravec’s new Piano Quartet receives its world premiere at Garth Newel Music Center inWarm Springs,VA. Commissioned by Garth Newel, the four-movement, 20-minute work will be performed by the Center’s resident ensemble—the Garth Newel Piano Quartet. Moravec will attend the premiere and will interact with audience members during an informal pre-concert talk. She continues, “We were thrilled when Paul accepted our commission proposal. This [new] work is comprised of moments of explosive energy, lyrical melodies, wide-ranging contrasts of mood and color, and virtuosic writing. He exploits the unique character and technical range of each instrument and creates wonderful textures. We’re excited to be premiering his newest work of chamber music.” Next season, the ensemble reprises Moravec’s Piano Quartetin October, and will be followed by an international tour toIstanbul,Turkey in November. Garth Newel (which means ‘New Home’ in Welsh) is located on a former private estate inVirginia’sAllegheny Mountains. The Center’s mission endeavors to share, explore and celebrate the infinite variety of chamber music in an intimate setting of natural beauty, through its performances, numerous educational programs, and personal interaction among musicians and guests. 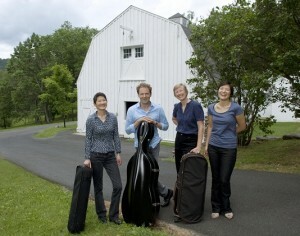 For more information about Moravec’s Piano Quartet premiere, click here.